Designed to be heavy duty, not heavy. Gibraltar's 9600 Series cymbal stands have a smaller profile, cast hideaway booms with hinged boom memory locks, double-braced leg assemblies that are perfect for multi-stand setups, and brake-style tilters. All stands have Gibraltar's Super-Lock height adjustments with hinged memory locks and ABS plastic inserts to eliminate metal-to-metal contact. The movable leg base rotates for multipedal setups. The patented direct-lever pull drive offers fast, quiet action and direct response. The exclusive Quick-Release Rock Plate improves the overall feel and action, and assembles and disassembles quickly and easily with a drum key. Also features Easy Step tension adjustment. 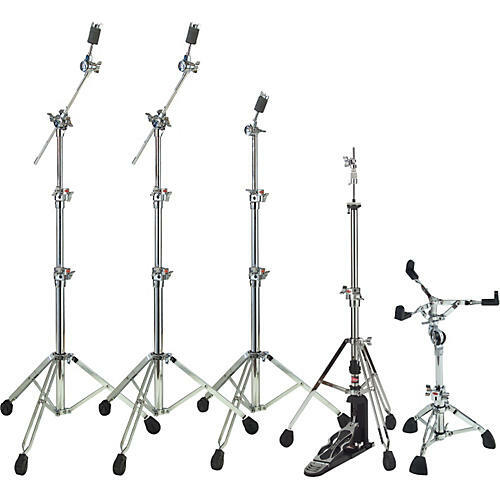 Gibraltar hi-hat stands are known for being smooth, fast, and solid. Brake Tilter with key memory lock, cast hideaway boom with 18" boom rod and hinged memory lock. Extends to 65". Collapses to 29". Gibraltar's brake tilter uses no gears, just a braking system that gives ultimate adjustments with a key lock memory position lock. Set your position with the wing nut, then lock it in place with the key lock. Brake Tilter with key memory lock. Super lock height adjustment. Extends to 64". Collapses to 30". No gears, just easy "Ultra" adjustment to get the exact snare basket position. Sturdy tripod base with Gibraltar's stabilizer "super foot" and hinged height adjustment with memory lock. Adjusts 18" to 24". Collapses to 16".